I've been getting strange looks from people lately. People have been genuinely concerned for me. I didn't think one single event could instill such shock in people. I stopped carrying a Palm. I've been carrying a Palm device a while after they were first introduced in 1996.The first Palm I bought was the venerable Pilot 1000 with a staggering 128k of memory (That was like a thousand contacts or some other BS number they used at the time). One of the reasons I liked the Palm so much was because the applications "just worked" and the platform was open, so I could get programs for it to enhance the built-in functionality, and other people could develop desktop software for it. When I heard that I could use the Palm with Linux, that was the selling point I needed to go and get one. Over the years I've upgraded the Palm; first to the Professional (using the 1MB OS/RAM card for the Pilot). Later I picked up a Palm III, Palm IIIx, and finally to the Sony TG-50. I've used the Sony TG-50 since 2003, and it has served me well. The batteries are starting to get a little old, and the device can barely power its way through the balance of an hour with the backlight on, but for the most part I'm very happy with the device. People got quite used to me using my organizer to jot down notes and look up addresses. It became a part of my work life and work style. The Palm is a great organizer, and I can whole-heartedly recommend it for anyone who wants to use a portable digital organizer. There's a lot of great programs out there for the Palm. Unfortunately, the same can't be said for the Linux desktop scene for Palm. I've been using JPilot now for quite some time. Don't get me wrong: It's a great Palm desktop solution for Linux, and has more than enough support for the Palm devices out there. The developer has done a spectacular job of creating a very usable interface. If JPilot had not been around, I can safely say the Palm would have lost all functionality to me. The problem is that there's not much else under Linux that one can use reliably with the Palm. Most of my data entry is at the desktop level, so anything that I want to capture has to be fitted for the Palm device using a tool like JPilot. Any advanced software like LifeBalance is useless to me because there's no Linux component. I used Bonsai for a while on a Windows only setup, but the linking between the desktop and the Palm had a tendency to break down if stressed too much. There are several other interfaces for the Palm under Linux, but most are either too fragile (I decided to try Evolution again, only to see it crash during hotsync because of some glitches in the pilot-link to Evoution conduits) or too cumbersome to use for GTD. After several weeks of searching, I determined that JPilot was the best Palm desktop out there for Linux, and I was tired of it. So, if not the Palm, then what? One piece of software that drew my attention was Tracks. 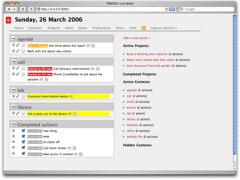 Tracks is a Ruby on Rails application using AJAX and all of those other Web 2.0 compliant buzzwords. The beauty of Tracks is the linking back to projects. Tracks is nice in that it will keep a project link handy so I can click back and see what that next action relates to, and if need be, change it. One of the holy grails of lazy "Getting Things Done" implementations is the linking between Next Actions and Projects. This fanciful idea generally starts when one either combines the phases of work, or gets really lazy about a weekly review. I found I did both, and it caused me some problems later on. One of the problems I had with my Palm setup is my combining of the Collecting and the Organizing phases (which is strictly verboten, but I still did it because it was convenient at the time). With the Palm, I'd quickly jot down an action like "Search Google for SSL information" and stuff it into my @Computer Web context. Unfortunately, by the time I actually find time to do that task, there's less chance of me remembering that it was the next action for "Set up Apache with SSL on Lister", so I'd gloss over it for something that has more meaning. This isn't usually a problem if one does the weekly review with any regularity, as old next actions can be shuffled away, and new next actions can take their place (or my internal editor can change it to read "Search Google for information on setting up SSL with Ubuntu and Apache). Unfortunately, after having lackluster weekly reviews for over six weeks, the whole damn system fell apart. I started looking at my lists with disdain, and started blaming the tools I had used for many years for not keeping me current. With Tracks, every project and next action are linked together, so I can click on the Project link from a Next Action to see what it relates to, or I can click on a Project to see what Next Actions are currently in play. That's functionality I find VERY useful, even with a stellar weekly review. Another feature I like is the ability to know when a Next Action entered the system. I'll admit that I have a lot of projects in my system that are getting very very old (I have 178 next actions right now, according to Tracks). Over time, the ones that haven't changed in any great detail turn yellow after a configurable amount of time. The older they get, the more yellow they get. Another nice feature is the "Done" tab, which allows me to see what I've completed in the day. It's a great motivator to see that I've actually been productive. Under the Palm, I told it to keep that completion out of my face at all times, so I didn't really get the sense of accomplishment. Converting over to Tracks also gave me the opportunity to clean up my system and do a thorough weekly review. Since I couldn't import all of my next actions in any meaningful way into Tracks, I had to come up with whole new next actions for each of the projects. So, by fiddling with a new system, I took the time to clean up that I hadn't done in the old system. One thing I'm curious to see is if I fall back into old habits with this system. (After all, I'd been using the Palm since I discovered GTD in 2001, and that system had several refreshes over its lifespan). Now, the Palm device did more for me than just Next Action / Project lists. I've used the Palm for my single calendar, and for my address book. It also serves as an impromptu notepad, and as my password management tool. I'm currently using Evolution for my address book, and passing .vcf files between work and home to keep them in sync. I'm using KeePassX for my password management. Google Calendar is now my weapon of choice for my calendar, and I have my calendar shared with Evolution (read-only, for now. All of the edits happen with Google Calendar until I can come up with a way to make it bi-directional). Memos? Heck, I can use whatever the heck I want for memos. This is a huge liberator because I don't have to be constrained to whatever fits on the Palm. Also, I now use paper for my Ubiquitous Capture tool.